Starring: Felicity Jones, Diego Luna, Alan Tudyk, Donnie Yen, Wen Jiang, Ben Mendelsohn, Mads Mikkelsen, and more. Another great day in Star Wars history is upon us as ‘Rogue One: A Star Wars Story’ is officially released to the public for the mega fans and the general public to take in. Almost exactly a year after Star Wars ended a ten year drought without a film release with their title of ‘Star Wars: The Force Awakens’, which was a sequel to the 1983 film ‘Star Wars: Return of the Jedi’. Here with Rogue One, we have the story of how the rebels acquired the plans to the death star and ultimately, how to destroy it. So now is the time we all are here for, the time for ‘Rogue One: A Star Wars Story’ to get Oberrated. 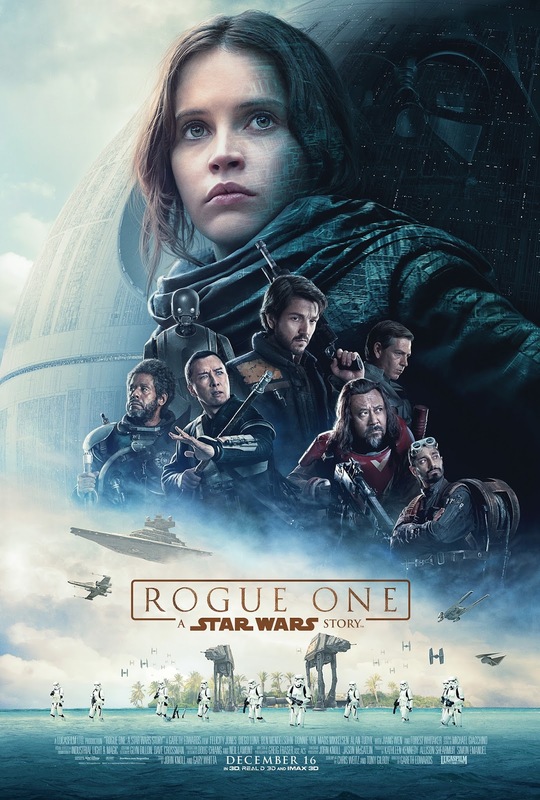 The story of Rogue One follows Jyn Erso (Felicity Jones) and her eventual involvement in a bigger scheme, as the rebels of the Empire devise a plan to steal the blueprints for the death star and ultimately find out how to destroy it. ‘Rogue One: A Star Wars Story’ ultimately is black and white for me. As far as a final result and my reaction of the film as a whole, it was great entertainment and a lot of Star Wars fun. The action, once it started up, was fast-paced and constant. The effects were a, as expected, beautiful sight to see and also a lot of fun per usual. And lastly, the connection of this film to the Star Wars universe was very well done. So regardless of what I am about to say, Rogue One is definitely worth the view or two as it is a treat to see a new take, or at least, a more detailed take on events that happened within the Star Wars story line. Now for the bad: Even though it is entertaining, how bad can a Star Wars movie honestly be with all the previous ground work already laid out? This film was great when based off of the action, the Star Wars feel, and a story that is already so developed, it is easy to create something within it. Now what about performances? This film was great when no one was talking. The leads, Felicity Jones and Diego Luna, lacked charisma and presence while on screen. I felt no major connection to them nor did I feel I cared about them in the least bit. Easily, the more entertaining characters were within the performances of Alan Tudyk and Donnie Yen who played K-2SO and Chirrut Îmwe. These two held attention and were loved characters for the personality that they brought to the screen. Not to mention, I am saying that a robot brought more personality than two humans… That is an issue to me… So beyond the two very weak main characters, the early first half portion of the film starts out very slow. For what may be the first thirty minutes, it is frequent location jumps and story development with little enticing moments leading up to what begins the fast-paced action that easily makes the movie worthwhile. Just to put the slow-paced start in perspective, I watched this movie once at a 10:30 PM showing on pre-release night and fell asleep. Yes, it is that slow. So, regardless of my negativity, the Star Wars fan in me was extremely satisfied with what I was given. The overall Star Wars feel of these movies will more than likely forever give me a satisfied feel when I reach the end of it but as I stated before, Disney would have to try very hard to fail when they have a tried and true formula already laid out before them. They are going to need to make new characters that can deliver powerful performances if they wish to come back to the status that Star Wars was at when ‘A New Hope’ and the original trilogy first came out. Posted in 2016 Movies, Disney, Movie Review.